Despite the lack of official VR hardware support from Apple, the iPhone has a number of options when it comes to VR headsets. These range in price from dirt cheap to cost almost $100. The growing number of VR apps and games on the App Store has made VR headsets quite a compelling purchase for iPhone owners. But if you’re not prepared to spend too much, which VR headset should you get? There are a plethora of options when it comes to mobile VR headsets. 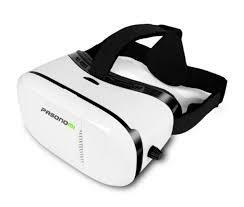 The large variety on offer is due to the fact that mobile VR headsets are not very complicated. That makes them easy to design and in turn that has led to many small companies coming up with their own products. Quality between these products varies greatly and some of these headsets can be downright nauseating due to the low-quality optics they use. Choosing between can be quite a task, and that’s we’d like to help. In this article we’ll be looking at good quality, affordable iPhone VR headsets priced below the $50 mark. If you have a bigger budget, you might want to take a look at our post on the best iPhone VR headsets. 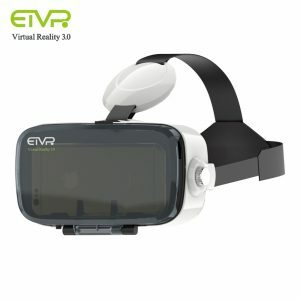 When it comes to looks and quality, no other VR headset does it better than the ETVR Virtual Reality 3.0. Looking at it you wouldn’t be able to tell that this is one of the cheapest mobile VR headsets on the market today. The design is very well done and the glossy front panel, although quite fingerprint-friendly, lends it a very premium look and feel. We really don’t know how such a cheap headset can be so well-engineered. The top strap is padded to provide you with a comfortable experience. The head strap can also be adjustable to provide you with the perfect fit. The ETVR Virtual Reality headset sits on your face via perforated padding that feels extremely nice and comfortable. The padding also helps keep your face cool if you’re wearing the headset for extended periods of time.The lens of the headset can be adjusted for focal length, and provide an adequate viewing experience. They do have the tendency of muting the colours as compared to more expensive headsets, so we suspect that they’re not of the highest quality. At this price, however, they’re justified. In fact, the ETVR is so well-built that we’d be recommending it even if it was priced higher. At under $25, it’s a bargain. 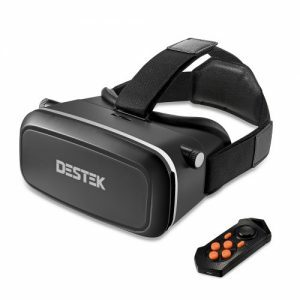 If you’re interested in an affordable VR headset that’s also capable of handling augmented reality duties, the Destek VR headset might be worth checking out. At a glance it doesn’t look like this headset would be capable of AR since the front panel is not see-through. Here the Destek has a neat little trick, as the magnetic front panel can be removed easily by simply pulling it from the rest of the headset. Now the camera of your phone is exposed and can be used for fulfilling the purposes of AR. Design-wise, the Destek doesn’t look too bad. It’s quite unassuming and won’t look odd when you’re wearing it. The headset is also reasonably comfortable wear, thanks to a soft top strap. The head strap also features padding at the back which we feel is a nice little addition to make it a little more comfortable. The focus of the lens can be adjusted conveniently via controls on the top of the headset. These controls don’t look very sophisticated but do the job well. The quality of the lens is reasonable without any noticeable distortion. The Destek is a good choice for an AR headset if you’re on a tight budget. The Pasonomi VR headset stands out from the rest of the headsets in this list for its incredibly lightweight. The lightweight is not only felt immediately as you hold it but also when you wear it. The lightweight certainly helps make it more comfortable since there’s less strain on your neck. There are horizontal guides inside which make the placement of your phone a very easy affair. This headset is also one of the rare cheap headsets which can accommodate phones larger than 6 inches. A major gripe we have with this headset is the way it approaches the mechanism of focal adjustment. Unlike other headsets where you can adjust the lenses while you’re wearing the headset, the Pasonomi requires you to adjust the lenses by screwing them in or outside the headset. While this no doubt works, we wonder why they went for this mechanism because it makes the job much harder, especially because lens adjustment is a sensitive process where you have to make minute adjustments as you see the picture. 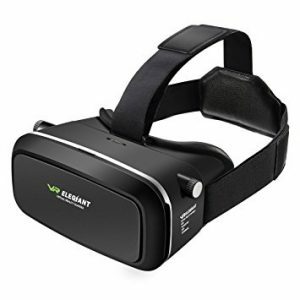 The VR Elegiant headset doesn’t look like a $20 headset. With a price very close to the Google Cardboard, this headset certainly delivers when it comes to value for money. The design isn’t particularly nice or eye-catching but it does seem to accommodate a lot of vents. Of course, vents are a necessary feature to have in any VR headset so that heat does not build up inside and cause foggy lenses and general discomfort. In practice, the vents on the Elegiant work quite well, and we it’s almost impossible to fog up the lens even in extended sessions. The lens themselves can be adjusted individually for focus, which we find to be quite a nice design feature. Image quality is quite reasonable and we couldn’t find any disproportionate amounts of distortion. Color is spot on as well. What’s more, the magnetic front panel can be removed to turn this into an AR-capable headset. All of that is $20, what more could you want? In terms of comfort, the Elegiant is a mixed bag. The head strap has been designed quite nicely and the top strap is padded for added comfort as well. The top cap can feel fine for some and downright uncomfortable for some, since it cannot be adjusted. 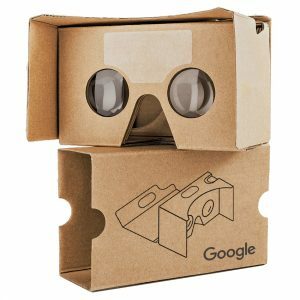 The Google Cardboard has been an incredibly popular option for people looking for a cheap VR headset. There was a point in time when it was the only cheap headset, but now the market is absolutely flooded with cheap VR headset. As the headsets in this list point out, cheap no longer means bare bones or terrible when it comes to mobile VR headsets. Headsets like the ETVR prove that good quality VR headsets don’t have to be expensive. And when it comes to value for money, the rest of the headsets on this list beat the Cardboard hands-down. But we still that the Cardboard is worth looking into, if you want something that’s simple, light and incredibly easy to use. It certainly won’t do AR and isn’t very fancy to look at. It is however incredibly light and that gives it a certain level of comfort. It doesn’t earn our no-questions-asked recommendation, but if you’re looking for something simple and something that can be thrown around, the Cardboard fits the bill perfectly. The market is littered with cheap mobile VR headsets. A quick search on Amazon returns countless results of VR headsets from an equally countless number of companies. Choosing between these headsets can be a chore. The VR headsets listed above should suit the budget end of things, and even when considering quality mobile VR headsets some of the options like ETVR can be considered. If you’re intrigued by the growing number of VR apps and games for the iPhone on the App Store, pick any one of these cheap headsets and be prepared to experience a totally new dimension in entertainment. At under $30, the novelty experience they’re capable of providing is something quite amazing. 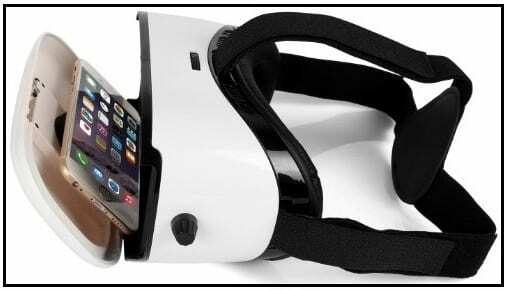 If you have decided to buy affordable iPhone VR headset, take a look at how to use a VR headset with an iPhone.